We offer FREE EXPRESS SHIPPING within New Zealand, including rural addresses. Please go our delivery page to learn more about delivery times frames. Yes of course! 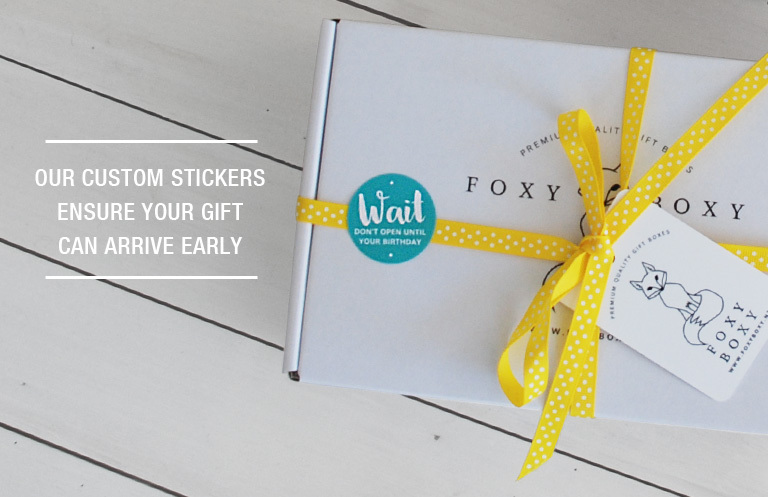 We pride ourselves on our ability to deliver our FOXY BOXY gift boxes quickly and efficiently. We always endeavour to deliver your gift as close to your preferred delivery as possible. We have created a bunch of custom stickers to help remind the giftee not to open your gift early. There’s the “wait don’t open until your birthday” sticker shown below and a few other options too. These stickers are free of charge. We do not ship internationally at this stage, due to the perishable and fragile nature of some of our gifts. I need to send multiple boxes to different addresses? The fastest way is get in touch with our team via our contact form or email us. We’ll put your order together so you can pay for all your gift boxes in one easy step. Can I customise the gift box? We understand there is a need to customise a gift box occasionally. Maybe your giftee has food allergies, dietary restrictions or you just want to make sure the gift is the perfect fit. Whatever the case may be, please use our contact page to get started customising a gift box today.